After our day exploring Rome it was back to the airport to pick up Mel and Cathy and our car that I would be driving for the rest of the week. It was really nice to have a private driver to get us from the airport to Rome and back again. Considering how crazy the driving looked in Rome, I know I would never drive in Rome! 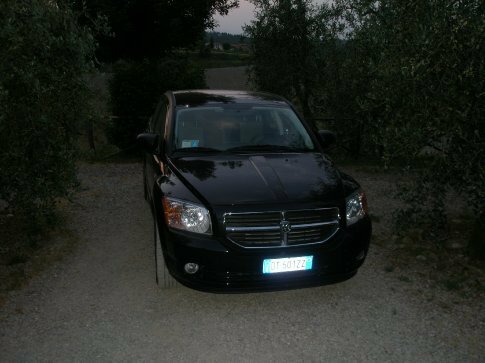 Anyway, after an interesting drive back to the airport (rush hour in Rome,) our driver took us to get our rental car. When we arrived at Sixt’s desk we were greeted warmly with, “You are not supposed to be here until 11:00AM.” So let the fun begin! The lady decided to help us and checked to see if they have any cars available. Luckily they had two! Of course, she asked which one we wanted and all she gave as a description is, "Do you want the Caliber or the Golf." It should be noted they don’t have any pictures or descriptions anywhere to be seen to help us with the choice. Instead we just tell her it doesn’t matter, so Caliber it is. Okay, on to signing paperwork and giving her our passports to scan. At this point, I realize I have left my passport in my backpack in the car with the driver. So I get to run all the way back to grab it before we can get the car. Once the paperwork is signed and passports scanned we go back to load our bags into the car so that there is room for Mel and Cathy’s bags in the driver’s car. At this point, we discover the Caliber is a Dodge Caliber and a nice looking car. I’m thinking this will be a nice car to drive around Italy for a week before getting back to my SMX. Now that the Caliber is packed with our bags we head back to the terminal with the driver pick up Mel and Cathy. While waiting we discover we have helped create a line of private and taxi drivers who are all waiting for people. It was interesting to see a line randomly in the middle of the walkway. After welcoming Mel and Cathy to Italy we take them to our driver who must of just got done yelling at or getting yelled at on the phone...let the adventure continue. Even though he's now not in a great mood, I still liked our driver. We make our way back to the Caliber and load their bags. Everyone is now in the car, but me. I open the door and what do I see...something that shouldn’t be there! A manual transmission! I have never driven a manual transmission outside of a grain truck a couple times. I don’t think I can fully express my feeling of being in a foreign country who drives on the RIGHT side of the road after driving on the LEFT side for the last five months and never driving a manual transmission on top of a country that is not exactly flat anywhere! After standing there in shock and everyone asking me what is wrong and explaining what the issue is, Arielle and I walk up to Sixt’s desk by the cars for help, where Arielle does the talking, because I’m still in shock of what I might have to try to do. She asks the guy if we can trade to an automatic because neither of us has driven a manual and don’t know how to. The guy tells us that they only have a couple automatics and they are out. Additionally, the only automatics they currently have are the SMART cars. (Which we would need two of those to get anywhere!) At that point we are still standing there with “deer in the headlights look” trying to decide what to do next. Arielle tries to get more information out of the guy which ends up going no where, the guy was no help at all. He finally goes let me see your paperwork, Arielle hands him the paper and he barely takes a look at it and goes yep this is for a manual and hands it back. Deciding we were getting no where we head back to the Caliber to decide what to do next. We all discuss the current situation. Noting that Mel and Cathy are the only ones with manual transmission driving experience, since England for the most part only has manuals. After a few more minutes of discussing I decide I am going for it! I get the car started up and start driving forward only to discover I am going the wrong direction, which is pointed out by the guy who was no help, so I stall the car trying to figure out how to get the car into reverse. Since I didn’t notice I needed to pull up and shift. Once I got the car backed up and turned the other direction off we went on the adventure of my first manual transmission car! Needless to say I don’t think anyone in the car will ever forget the entire driving experience, but we all, including the car did make it through the week! Thanks again to Mel and Cathy for their patience.